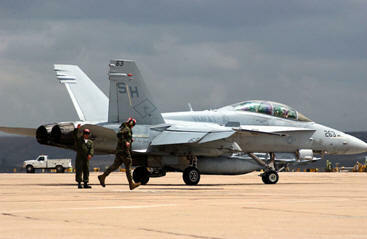 April 7, 2012 - An F/A-18D assigned to Strike Fighter Squadron (VFA) 106 crashed in Virginia Beach, Virginia on Friday. Approximately 12:05 PM the jet crashed just after takeoff at a location just off of the base. 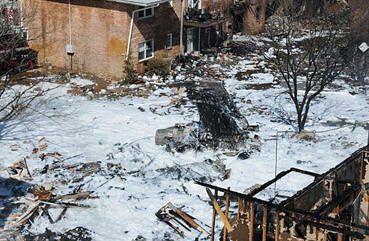 The F/A-18D crashed into an apartment complex destroying a number of homes. 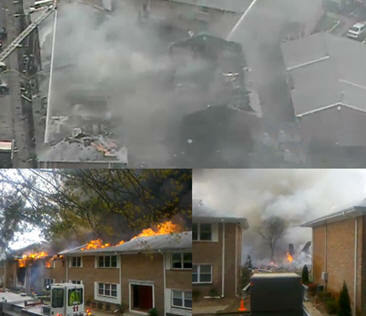 Smoke and flames consumed the housing complex. Capt. Mark Weisgerber with U.S. Fleet Forces Command said the F/A-18D jet had dumped its fuel just before the crash, though it wasn?t clear if that was because of a malfunction or an intentional maneuver by the pilots. The pilots onboard included a student and an instructor, it has been reported the instructor was an ?extremely experienced? pilot. Both pilots safely ejected from the aircraft. VFA-106 is based at Naval Air Station Oceana, and serves as the East Coast Fleet Replacement Squadron. Their mission is to train Navy and Marine Corps F/A-18 Replacement Pilots and Weapon Systems Officers (WSOs) to support fleet commitments. By late evening emergency responders were searching through the charred remains of the housing complex in which 40 apartment units were damaged or destroyed. In total, seven people, including the pilots were taken to an area hospital. All except one of the pilots were released by nightfall. At this time three residents remained unaccounted by late Friday said Virginia Beach Fire Department Capt. Tim Riley. At this time no fatalities had been reported. Adm. John C. Harvey, Jr., commander, U.S. Fleet Forces said "My thoughts and prayers are with our citizens and families who have been impacted by the tragic crash today in Virginia Beach by an aircraft from NAS Oceana. I deeply regret that some in our community have lost their homes, and I, like many, pray for the well-being of all. "I must also offer my deepest gratitude to the citizens of Virginia Beach and the Mayfair Mews Apartments, as well as Virginia Beach's first responders, for their immediate and heroic response to take care of our aircrew after they ejected and all at the scene of the mishap. "I have spoken with Mayor Sessoms, and all the resources of the Navy in Hampton Roads are being made available to the City of Virginia Beach as we all deal with the impacts and recovery from this terrible mishap. "We will continue to work directly with the City of Virginia Beach and continue to provide all possible assistance. We will conduct a complete investigation into the cause of this mishap and share all information we have as soon as we are able to do so." Naval Air Station Oceana or NAS Oceana is a military airport located in Virginia Beach, Virginia, and is a United States Navy Master Jet Base. It is also known as Apollo Soucek Field, named after Lieutenant (later Admiral) Apollo Soucek, a Navy Test Pilot who set the global altitude record in 1930 by flying a Curtiss "Hawk" biplane to an altitude of 43,166 feet. NAS Oceana is the only Master Jet Base on the East Coast. The McDonnell Douglas (now Boeing) F/A-18 Hornet is a twin-engine supersonic, all-weather carrier-capable multirole fighter jet, designed to dogfight and attack ground targets (F/A for Fighter/Attack). Firefighting foam covers the scene of a crash of an F/A-18D Hornet assigned to Strike Fighter Squadron (VFA) 106, April 6, 2012. Initial reports indicate that at approximately 12:05 p.m., the jet crashed just after takeoff at an apartment complex in Virginia Beach. Designed by McDonnell Douglas and Northrop, the F/A-18 was derived from the latter's YF-17 in the 1970s for use by the United States Navy and Marine Corps. The Hornet is also used by the air forces of several other nations. It has been the aerial demonstration aircraft for the U.S. Navy's Flight Demonstration Squadron, the Blue Angels, since 1986.